Whether scarce or abundant, it is always a good practice to conserve resources. Making the most of every asset is part of the prepper’s creed. This is important in every area of prepping: the beans, the bullets, and the band-aids. The longer our supplies last, the better off we’ll be. It’ll cost less in the good times and our cupboards will remain full longer in times of adversity. But being thrifty is not just for prepping at home; it’s also very important in survival situations. What do I mean? Subtle changes to how you use and consume the resources around you while effecting survival can have a major impact on how long those resources are available. Why use your knife blade to scrape bark from a cedar tree when you can conserve the blade’s edge and use a sharp stone to collect the tinder? Why use a match to start a fire when you can coax last night’s fire back to life with a little tinder and some gentle blowing? Why build a roaring bonfire on a warm summer’s eve when a small camp fire will suffice to cook your meal and purify your water? Why eat the last of your store-bought rations when you have a stream full of small fish that can be easily caught? In survival situations as well as in daily life, it pays to be thrifty. As the axiom states: waste not, want not. Being mindful of how you use the resource available during a survival situation gives you a better chance to effect survival in the long run. Remember, hope for the best (an early rescue) and plan for the worst (being stranded for an indefinite length of time). If you eat an animal, bird, fish, whatever, save the bones use them as the bassis of a stew. We would buy a galon of mike and cut it with a galon of evaporated milk. And we would take care of the things that we had, keeping all of our tools and knvies Clean Clean Clean! Cleaning our cloths, and mendin tears in them as soon as they happened. Preventive maintance was the best way to make our gear last a long time. We could learn a lot from your father’s generation, if only we’d listen. Sounds like you learned that lesson a long time ago, Jeff. They are called “The Great Generation” for a reason! And there are still Thousands of them out there!! Not anyone in your family that old? do some volenteer work at a nurching home, deliver meals on wheels. I am only 42, but I spend the greater part of my childhood sitting and listening to “the old Floks” tell stories, tell about the hard times and the good times. For me it was the best part of my schildhood. I still love my elders and honor them. and any time I get a chance I get to know them better. 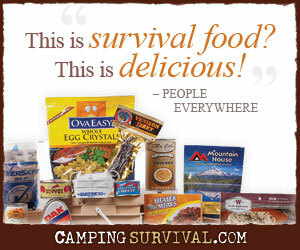 They are a VAST resource for preppers, and for the soul. Absolutely. I spend most of my summers on my grandparent’s hobby farm. I learned a tremendous amount there – from gardening to stringing barbed wire, from dressing a fish to swinging a pick-ax. And most of all, about honesty and hard work.